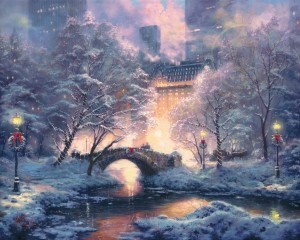 Central Park is an amazing focal point for New York City. People of all cultures and backgrounds enjoy its natural setting nestled deep within the walls of this iconic city. The holiday season adds a special charm to the park as holiday lights illuminate the snow dusted ground and chilled winding creek. In the background, The Plaza Hotel stoically braves the winter air. A stone’s throw away the merchants of Fifth Avenue ply their holiday goods as New Yorkers hurry to complete their holiday preparations. In every sense, the city is in full celebration.